Save Versus All Wands: Your Campaign Setting: Middle-Earth or Narnia? Yes. It's got to be one or the other. Middle-Earth is a stand in for a more naturalistic setting. Yes, it's a fantasy world. But given certain assumptions, it makes sense. There's an explanation and a reason for everything. It's consistent. Narnia indicates more of a fairytale setting. It might have rules, but they are the twisted rules of faery. Or at the extreme, anything goes. Now, I think in previous posts I've made a few small snarks at what I have called 'naturalism' as understood in the above context. But my purpose here is not to say that one approach is better than the other. 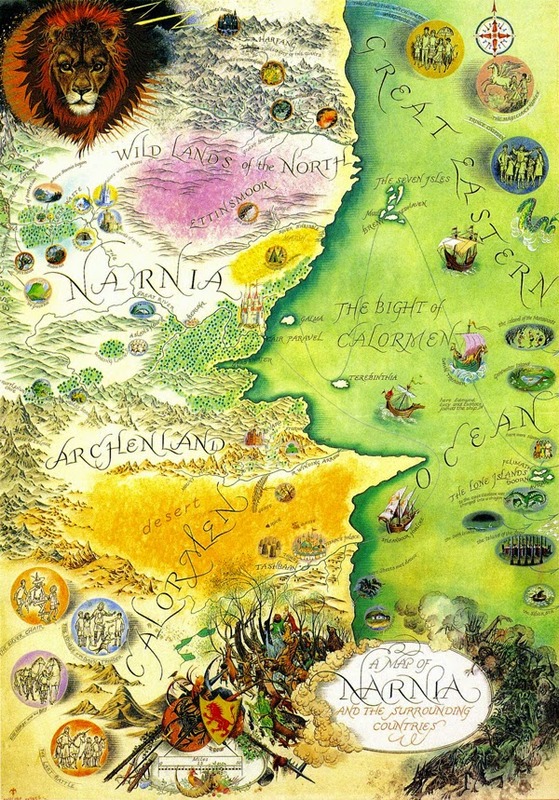 If I seem to argue for Narnia it's only because I think it's been unfairly neglected as a viable alternative. Let's first look at Middle-Earth. In his seminal study Tolkien: Author of the Century, Tom Shippey convincingly shows that one reason why Lord of the Rings works and works so well is that J.R.R. Tolkien built it up from firm mythological and linguistic foundations. We all know that Tolkien started with the language, then created the history, then, almost as an afterthought, wrote the story. Of course it wouldn't have worked if he had not been an outstanding tale teller. Thank God he turned out to be. But every creature, every place, every name has some basis in Old Norse or Old English, or well, some language or another as long as it was old (and Northern European). Shippey convincingly shows that only a handful of scholars at the time (and sadly, perhaps none in the present) knew as much about these languages as Tolkien did, such that they could have fully appreciated the depth and accuracy of what he accomplished. Yet one of the reasons that his writing resonates with us--even though we almost certainly are not fluent in, say, Medieval Icelandic--is that at some level (perhaps even an unconscious one) we understand that it's all consistent and all true--in the sense of being based on actual, partially internalized myth or dim linguistic memory. Okay, perhaps I'm not putting it quite right. But you get the idea. Now, Tolkien and C.S. Lewis were friends. But it's no secret that Tolkien found Narnia less than satisfying. There was no deep tonal underpinning to it. It was just a story for children with nothing less and nothing more than the sorts of things that children might like--witches, dragons, talking beavers, even Santa Claus. He found this annoying. I don't. I like both approaches in the context of fiction, although I agree that from the point of view of sheer artistic value and weight. Tolkien's Middle Earth would have to win out. I agree with Shippey that, given certain assumptions, Tolkien is not merely the fantasy author of the century, but the author of the century. That's a big deal. But what works from the point of view of an OD&D campaign? I think it's fair to say that many of us have had grandiose visions of being, well, Tolkien. Give me a few uninterrupted months (away from my studies, my job, my usual family responsibilities or whatever), and I will create a consistent world that my players will appreciate and love. I'll put together the natural history, the political history, the languages, the religious anthropology and all the rest, and it will be rich, cool, consistent and, in its way...true (just like Tolkien's). Now, I think this is laudable. But let me suggest two potential problems with it: 1. None of us has the time or (sorry) the knowledge to really do it justice. We just don't. None of us is Tolkien. But perhaps more importantly, 2. what works for successful fiction does not necessarily work for successful campaign design from the point of view of gaming, or more accurately, fun gaming. Plenty of referees and players have discovered (partly through purchasing Middle-Earth settings such as the 1980's I.C.E effort) that Middle Earth is neat to have as a setting for a story but in the end is often pretty boring to play a fantasy adventure game in. Quick quiz, which setting--Middle-Earth or Narnia--features more OD&D creatures? The answer is Narnia by about a mile. Here's a partial listing of Narnia creatures that were on the original OD&D lists, most of which did not appear in Middle-Earth: Apes, Giant Bats, Bears, Giant Beavers, Boars, Hobgoblins (though called 'boggles' in Narnia), Centaurs, Dryads, Efreet, Ghouls, Giants, Gnomes, Griffons (spelled 'Gryphon'), Incubi, Djinn, Minotaurs, Mermen, Ogres, Pegasi, Salamanders, Sea Serpents, Spectres, Sprites, Giant Squid, Trolls, Unicorns, Werewolves, Evil Wolves and Wraiths. OD&D isn't Chainmail set in Middle-Earth, it's Narnia plus dinosaurs and robots. AD&D and then the successive editions of AD&D and 3.0+ D&D gradually diverged from this. In part this was because the basic D&D setting with its canonical monsters from original diverse mythologies more and more became a naturalistic setting. We forgot that these creatures came from wildly different traditions. The set of them became a myth of its own. Language groups and families were postulated, natural histories of the different races and creatures were invented and so on. It was a series of brilliant posts by Wayne Rossi's in his blog Semper Initiavus Unum On the OD&D Setting that first jolted me out of seeing things in the naturalistic terms that my teenage exposure to AD&D predisposed me to. I'm not saying this view is necessarily better. But I am saying it's a bit truer to OD&D and certainly worth considering. For the sense of wonder, magic, romance and, yes, fun. I tried to do it for my own game. Man, after just reading 6 of 7 of the Narnia books last week, I'd *positively love* to game in Narnia! I could care less if much of it is 'for kids'... Especially considering playing along those veins sparks a certain innocent charm that can be just as fun as the blood-royale, Tankards and Tavern-wenches style of swords and sorcery gaming that I also love so much. Either can be a whole lot of fun. And man, those Narnia books are chock-full of stuff to do and places to go! I suppose If I ran one, I'd start a game right after Peter, Susan, Edmond and Lucy just got back from their first time in Narnia so there quite a bit has already happened that can set a precedence of 'understanding' in the gamers who've read at least part of the series. Probably begin the campaign in that time and maybe before Prince Caspian shows up. And how could someone *not* want to play a reepicheep!! Yes. Pauline Baynes, as we know. There's a great tribute site at: http://www.paulinebaynes.com. It's funny. Whenever I set out to create a setting for D&D, I want it to be "Narnia." Or rather, the D&D Cartoon from the 80's. Weird magical locations, unknown and unknowable creatures and stuff. Then I start working on this country and that section of the map, and pantheons and conflicts and legendary heroes... Before I know it, I've got "Middle Earth." Well, Middle-Earth-lite, anyway. Well, there is also the Horse and His Boy. So there is room for a little Middle Earth specificity in the grand wonder of Narnia in general, I would say. I'm definitely more of a Narnian when I GM. Though as of late I've become more of a Dying Earth sort of guy. Narnia is what I want. Took me awhile to figure that out. It is hard to get that sense of wonder when it is all so familiar. For me that surprise is part of the draw. When I'm on a gaming hiatus - like I am now - I find myself being drawn to naturalistic settings. Oh, I regret selling all my MERP stuff! My, wouldn't it be good to run a pseudo-historical low-fantasy game. And then I remember what I wrote about Titan (the Fighting Fantasy world) - which bears a striking similarity to what you have written here about Narnia. I just added your blog. Sorry for not seeing it. I didn't know very much about Fighting Fantasy either. Yes. That's a great post that precisely nails that sort of approach. As you put it, D&D "default game world" is more narnian that tolkienian. Running a Middle Earth D&D campain would require a lot of "substraction" (no high level spell, no cleric, and almost none of the Monster Manual). With Narnia you could keep "adding" . I noticed that most fantasy game world are described using things like solar systems, number of moons, orbital periods, rotation rates, weather patterns, etc. The exact kind of stuff you'd expect from a science fiction RPG. The only one I can think of that doesn't follow this pattern is Glorantha. A world clearly more fantastic than realistic. NRA Santa handing out plussed-up lewts to kids? Hell yeah! Sorry to comment so late, but I just found your blog. My campaign world of choice is and always has been the World of Greyhawk. Even before the Folio was published in 1980, I'd seen enough fascinating glimpses of Gygax's home game in the rulebooks, the modules, Dragon magazine, Norton's Quag Keep and various articles and interviews to know that was my fantasy world. If forced into your false dichotomy, Greyhawk is hands down Middle Earth, even though both Gygax's world and mine grew organically according to the imaginations and whims of the players rather than being carefully designed. Despite using Gygax's source material, my Greyhawk is different from his. And it's entirely incompatible with Carl Sargent's take in From the Ashes. But I also think you're unfairly seeing Narnia where it isn't, and failing to see Tolkien where it clearly is. Case in point, your creature list: Middle Earth has vast areas that were never explored. Who can say what lives there? Aside from elves going to and from Valinor, no one ever recorded an ocean voyage. That makes it kind of difficult for characters to meet Mermen, Squid or Sea Serpents (but there was a lake monster in the pool outside Moria). No characters ever travelled to the jungles where Oliphants originate, But if they did I'd bet there's Apes & giant bats too. Just because we didn't actually meet various types of elementals, demons or undead doesn't mean they aren't there. One of Sauron's titles was "Lord of Werewolves", QED, there were Werewolves. Bear tracks were found all around Beorn's house. QED, there were bears. Pork and Ham are mentioned. QED, there were boars. Perhaps there were no Gnomes, but there may as well have been: he called them Hobbits. All that is speculative. On the other hand, you must have just flat out missed or ignored Tolkien's Giants, Ogres, Trolls, Evil Wolves and Wraiths. Everything in Tolkien's work either came from carefully selected mythologies, legends and folk traditions, or was invented by him. On the other hand, Lewis' anything goes approach to Narnia allowed him to draw story elements from just about anywhere, but also meant he invented fewer things that were uniquely his.own. Tolkien's influence is clearly identifiable throughout the early D&D material. TSR tried to disclaim it because they were terrified by the prospect of being sued by the Tolkien Estate. But I can not think of a single thing in any version of D&D that was unique to Narnia, or invented by C.S. Lewis. There were some coincidental elements that were also in Narnia, but probably derived from other sources in D&D. This is not to say that he didn't heavily influence D&D as played by many people, but only that nothing unique to him found it way into any of TSR's published rules, settings or adventures that I am aware of. Narnia is surprisingly dark if you just look at the setting itself apart from the gentleness of Lewis's narrative voice: cannibal giants, immortal half-demon enchantress as regicidal serpent, pretender king sets out to murder his nephew, dwarven necromancy ... leave the setting the same and switch the narrative voice to John Bellairs and you've got a grim world to explore. Interesting distinction between the Middle Earth and Narnia; for me the distinction between both of them is anagogy/symbolism versus allegory, respectively.